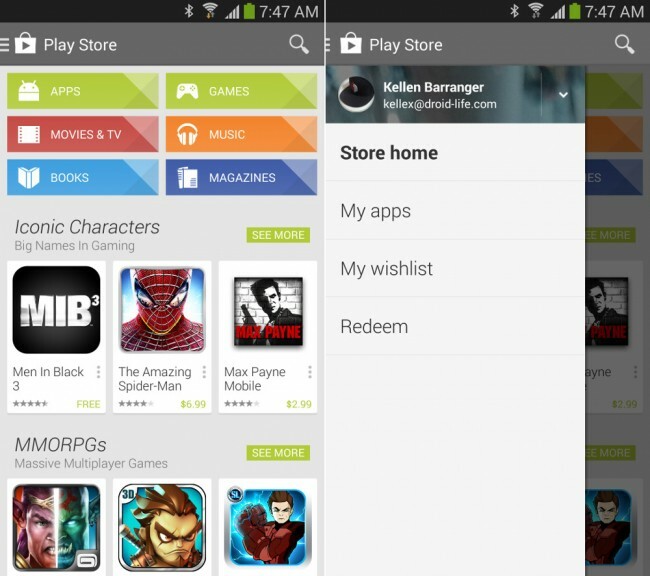 On Monday, we got a hold of the newest version of Google Play, dubbed 4.4.21, and handed it out like candy on Halloween. If you decided to hold out and not manually install it at the time (and there is nothing wrong with that), then you’ll be in for a treat this morning as the update has started to rollout to all users. We’re pointing this out because there is a semi-significant change in how you navigate Google Play starting with 4.4.21. In build 4.4.21, you’ll no longer see the action overflow menu up in the top right corner next to the search bar. Also, if you have a Samsung device and hit the Menu button, you’ll no longer see options other than Settings and Help. But where did “My Apps” and all of the other goodies go? In a slideout navigation or “hamburger” menu tucked into the left side. For those not familiar, the “hamburger” menu is the 3-stacked lines in the top left that when tapped, pulls out the navigation menu. You have seen it in a variety of apps, so it’s not necessarily new to you in general, just in this app. With a simple swipe from the left edge of your device, a menu with My Apps, My Wishlist, and Redeem will all appear, along with a drop down menu that will let you toggle between accounts, should you have more than one.